its extraction performance or percentage recovery: quantity of DM in the sediment comapred to the total quantity of suspended solids at the inlet. for the same diameter, when the LT/D ratio increases from 4 to 5, depending to the sludge, we will improve the mass flow rate from 30 to 50 %. 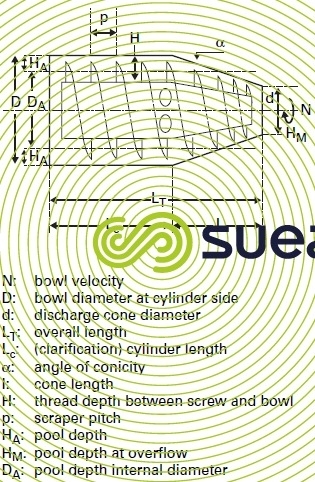 The angle of conicity usually ranges from 8 to 12° for all applications. Narrower angles (6-7°) can be used to extract particularly problematic sediments (thixotropic textured, sticky sludge such as drinking water sludges or carbonate removal sludges). Wider angles (20°) can be used to extract sediment that has a firm and compact texture: this produces a larger cake internal storage capacity and, therefore, a small increase in mass flow rate. A wide space will allow sediment reisdence time in the machine to be increased and, therefore, prolonged centrifugal force action. The narrower this space, the higher the compression rate applied to the sediment. This is one of the key parameters in centrifuge development, increasing dry solids content and justifying the designation of HP (high pressure) centrifuge applied to the more efficient units available from different constructors. 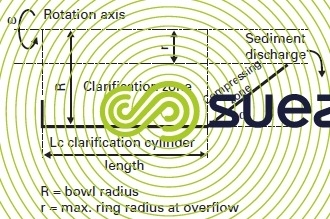 A machine’s flow rate Q will increase with the surface area. Figure 33 illustrates 2 principles. 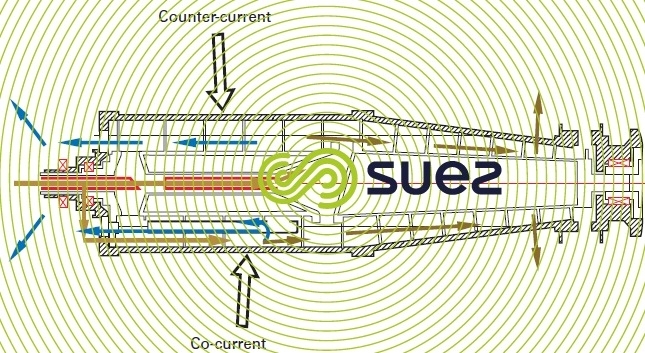 The co-current system (inlet at the beginning of the cylindrical section) still has its uses in certain cases where thickening takes place without polymer or with particularly problematic sludge (very light sediment); this system usually produces lower dry solids contents but good clarification. At present, the most widely used, the counter current system produces higher dry solids contents with higher mass flow rates. Additionally, versatile rotors are also available. This factor represents the single settling surface area equivalent to that of the centrifuge concerned operating at 1,000 g. Each manufacturer has his own method for calculating this Σ factor and, therefore, any comparisons must be conservative. In order to compare the machines with each other, Σ is calculated at nominal operating velocity N (developing a 1,000 g acceleration). Screw thread height and pitch have a major impact on machine hydraulic capacities. The screw extractor is the unit that is the most sensitive to abrasion. The screw thread is always protected by powdered tungsten carbide of sintered tungsten carbide tiles.